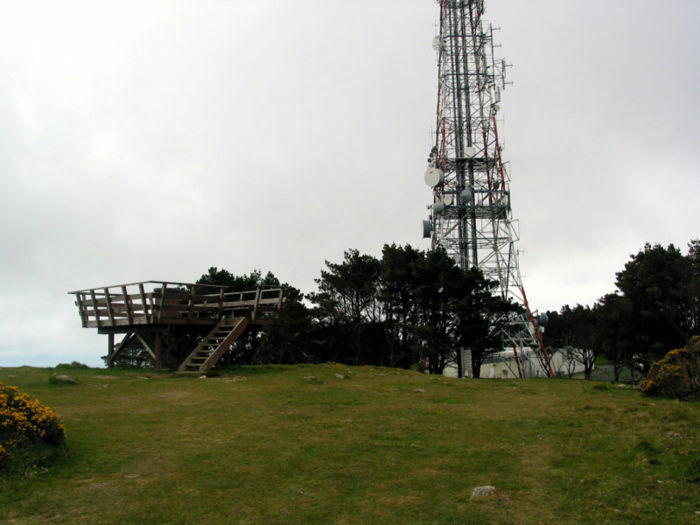 Kaukau Peg is the highest accessible summit of Mt Kaukau, home to Wellington?s TV transmitter tower. The walk to Kaukau Peg is an easy (though at times steep) walk along good paths, farmland, and well travelled tracks. This walk passes through some fine native New Zealand forest, and is only minutes from Wellington?s CBD. There are excellent views from the summit lookout, plenty of seating along the way, and an opportunity for a swim and snack at the end of the walk. From central Wellington, take either Aotea Quay or Tinakori Rd to the Hutt Rd (not the urban motorway), and then turn left up Kaiwharawhara Rd into the Ngaio Gorge. Turn right at the roundabout at the top of the gorge, and continue straight through the next roundabout onto Khandallah Rd. Simla Crescent is the first on the left, just before the Simla Crescent train station. To approach from the north, take the Johnsonville & Khandallah motorway exit, and head towards Khandallah, along Moorefield, Burma, and Box Hill Rds. Turn right at the Box Hill roundabout onto Cockayne Rd, and then right again onto Khandallah Rd. Simla Crescent is first on the right, just past the train station. There is a carpark by the Khandallah Park entrance on Simla Crescent, and another by the train station. From Wellington central railway station, take the Johnsonville line train to the Simla Crescent station. The trains run at least every half hour, from 6am to 11pm every day. Tickets are purchased on the train, and the journey takes 15 minutes. At Simla Crescent, exit towards the railway crossing, turn right, and walk 200m up Simla Crescent. 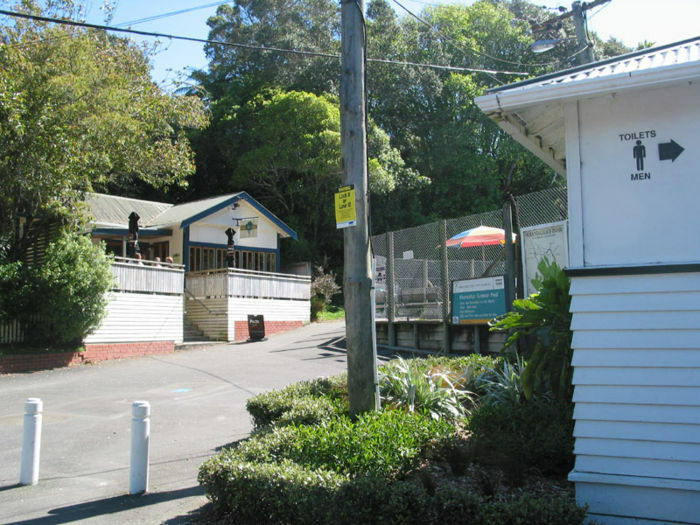 On the left you will see a small carpark, and signposts indicating pathways into Khandallah Park. See (Metlink) for further information. Stagecoach Wellington bus number 45 travels close to Simla Crescent, down Cockayne Rd, though this commuter service is at peak times only. The bus departs from Brandon St, off Lambton Quay. The train is a much better option, as it is cheaper, faster, and runs on weekends. 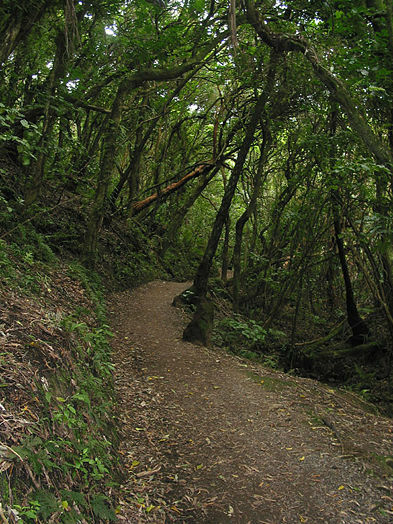 This loop walk begins from Simla Crescent and heads north up the southern ridge of Mt Kaukau. From the summit, the route branches to the west towards Johnsonville, before sweeping around to the south and down to the Khandallah swimming pool, through a children?s playground, and back to the Simla Crescent carpark. Moments after leaving suburban Wellington, you will find yourself in lush native bush. A few residential houses come and go on the initial part of the path, but these quickly disappear, leaving you to enjoy the quiet pathways through the bush. The first junction you reach marks the first of four paths exiting to the right, which all eventually leading to the Clarke and Woodmancote road ends. Upon completion of the loop, you will return to this junction on the way back, but for now, take the left hand path. The path rises further into Khandallah Park. The park was once a totara forest, the evidence of which can be seen in the large totara stumps and logs throughout the walk. The park today is mostly covered by broadleaf native forest, which has regenerated after the totara forest was cleared. 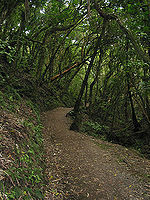 The forest canopy includes kohekohe, tawa, puketea, and rewarewa. Other smaller trees like kotukutuku, mamaku, puka, kawakawa, hangehange, pate, karamu, lacebark, and five finger make up the lower layer of bush. Throughout the walk, keep a eye (and ear) out for some of the native birds which inhabit Khandallah Park. Fantails, wood-pigeons, tui, as well as non-natives like thrushes and blackbirds. The path turns to a track at this point, and rises through more native forest, before switching at right angles and running up a ridge. 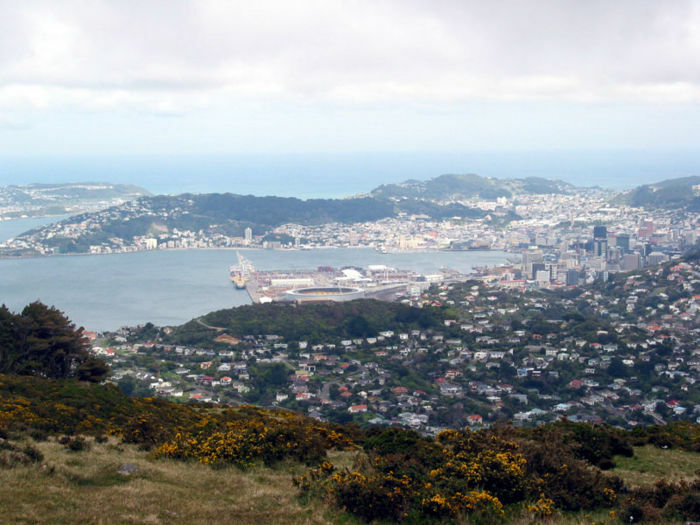 There are a number of seats scattered alongside the track, and some good viewpoints over Wellington city. Another sign marks the last spot where you can exit the Mt Kaukau path and head down to Woodmancote Rd or Clark St. Continue past the sign, and through 200m of pine forest. As you come out of the forest, you will see the transmission tower, another sign and a stile. The sign warns you to be careful during lambing season (August to October). After the stile there is a very short climb up a grassy track to the Lions Lookout. 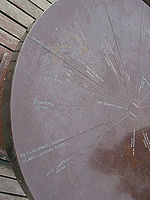 The lookout contains a direction finder, and on a clear day views stretch from the South Island, across Wellington, and up the Kapiti Coast. To the north lies the Kaukau Transmitting Station, a 122m high communications tower. 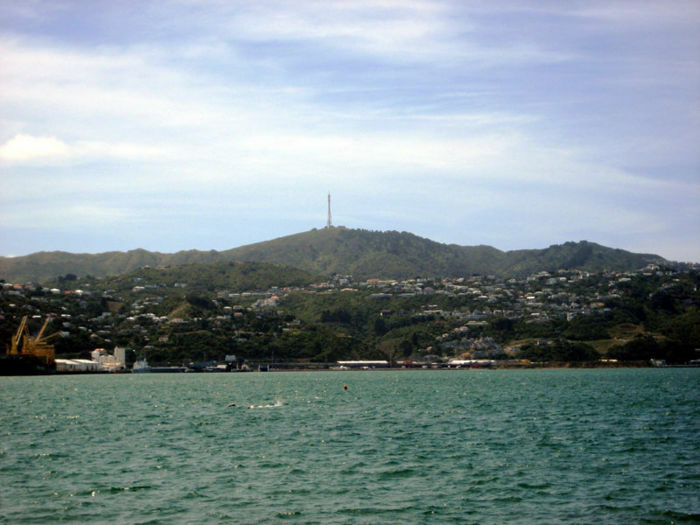 The tower transmits TV and FM radio signals to the greater Wellington region, the Kapiti Coast, and even the northernmost areas of the South Island. The land beyond the tower is private property, so please do not enter this area. From the viewing platform it can be seen clearly that only the eastern side of Mt Kaukau is covered in native forest ? the western side is used as farmland. Obviously you can retrace your steps back to the carpark if you wish, but a more interesting loop route is taken by turning right just past the lookout and heading down the hill. Continue on down this track and follow the signs to Woodmancote Rd (that is, take the first two right hand paths, and then continue on straight through the next two track intersections). Eventually you will pop out onto a grassy playground area. If you turn left here you can pop across a small footbridge and then turn left towards the Khandallah Swimming Pool, Caf? du Parc, public toilets, and an alternative Start/Finish point at the Woodmancote Rd carpark. From November through March, you might be tempted by a dip in the nearby Khandallah swimming pool, which is beautifully set amongst the native bush. The 30m outdoor pool was opened in 1925, and the funding for its construction was raised by local residents. Hours are 10am to 6pm every day, and entry is $2 for adults and $1 for kids. At the end of Woodmancote Rd, the historic Caf? du Parc provides refreshments, snacks, and meals. Originally built as a tea kiosk in 1926 by William Barnes, it became a private residence in 1973, before being restored as an eatery in 1999 by Patricia Kerr. The Woodmancote Rd carpark also makes a good alternative start/finish point for this walk, especially if arriving by car. Public toilets are also available here. To continue back to Simla Crescent, walk back into the grassy area and head to the end of playground. Turn left up the hill, and follow the path alongside a house. Then then turn left again and exit into the top of Clark Rd. Turn right, and head across to the Clark Rd carpark, where signs indicate tracks into Khandallah Park once again. Follow the sign to Simla Crescent, exit the carpark, and take the path a short distance into Khandallah Park. Turn left, then right almost immediately, and follow the Simla Crescent sign once again. Continue until you reconnect with the very first junction you met on your way up Mt Kaukau. Take the left hand path here, and retrace your steps back to the Simla Crescent carpark. From the suburban streets of Khandallah or Johnsonville, a number of different tracks lead up Mt Kaukau. With your own transport, (or some additional walking from or to one of the Johnsonville line train stations), it would be possible to begin and end your Kaukau summit walk at any one of a number of points, including Clark, Woodmancote, and Truscott road ends. All these tracks are of a similar standard, and are all well travelled and signposted.